Bite-Sized Austen: New interpretations in doctoral research. A public lecture by Colin Yeo, Doctoral student, English and Cultural Studies, The University of Western Australia. "Novels are so full of nonsense and stuff..." - Mr Thorpe, Northanger Abbey. A tone of self-awareness is a core aspect of the literary Gothic tradition. Writing within the paradigms of the eighteenth century Enlightenment's values of reason and rationality, writers of Gothic fiction ran the risk of alienating their audiences if their creations were too extravagant. At the same time, Gothic novels proved to be popular with the reading public. The late eighteenth century saw a proliferation of popular women writers of Gothic fiction. In the 200th anniversary of Jane Austen's death, it is worthwhile meditating on Northanger Abbey, a parody of Gothic fiction that is arguably one of Austen's 'lesser known' works. Austen's contribution to the Gothic as a textual mode that is self-aware cannot be understated. Northanger Abbey was one of the first of Austen's novels to be composed and was only published after her death. The novel satirises the Gothic, featuring a protagonist who is a fan of Gothic novels and imagines that she is a heroine in a Gothic novel. This presentation reflected on Austen's parody of established tropes and conventions of the Gothic. It also situated Northanger Abbey within its historical context as an important part of the Female Gothic tradition that emerged in the late eighteenth century. As evidenced by the 2007 filmic adaptation of the text, interest in Austen has been a constant aspect of contemporary popular culture, an important point to note as we move into the 200th anniversary of her death. Colin Yeo is a PhD candidate from English and Cultural Studies. Like Catherine Morland, he maintains a fervent interest in the literature of terror and horror, so much so that he decided to write his PhD thesis on the subject. His research interests are early modern literature, Gothic novels and contemporary horror film. A public lecture by Dr Peta Beasley, English and Cultural Studies, The University of Western Australia. Born less than six months apart, both christened Jane, both from the same class, pseudo-gentry, both share a deep friendship and intimacy with their sister, both remain unmarried, both are in Bath at the same time and both novelists. However, to one, Jane Austen, literary history has been kind, the other, Jane Porter, unfortunately now virtually unknown. Ironic, given Jane Porter knew great success during her lifetime, dubbed by twentieth-century critic Robert Tate Irvine, as “the Margaret Mitchell of 1803,” while Jane Austen knew only slow-growing success during her lifetime. 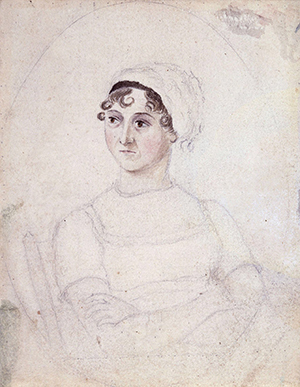 Although Porter, and her sister Anna Maria, admired Austen’s work enormously, it is unclear if Austen had reciprocal admiration for Porter’s work. But, there are two interesting intersections, both Porter and Austen had a professional scepticism (jealousy?) for the work of Sir Walter Scott, and both met, and were invited by the Royal Librarian, James Stanier Clark, to dedicate one of their novels to His Highness, the Prince of Wales. This presentation told the tale of the how the two Janes responded to the request. Peta Beasley’s PhD explored the issues of nationalism and heroism in the novels of Jane Porter (1776-1850). Peta’s publications include, a chapter titled “Transporting Genres” in Victorian Traffic, published by Cambridge Scholars in 2008, and a paper in Victorian Network (2009), entitled “Georgiana Molloy, Jane Porter and the Significance of Exploration Narratives for New Beginnings in a Strange Land”. She also co-authored a paper with Professor Andrew Lynch on Sir Thomas Malory, published in The Encyclopedia of British Medieval Literature in 2014 by Wiley-Blackwell, and contributed an article review for Tulsa Studies in Women’s Literature journal in 2015. Peta is a sessional teacher at The University of Western Australia and Edith Cowan University.